Sinkholes: Is it a natural or man induced hazard? Lately the subject of sinkholes has appeared on press due to a fatal incident in Florida USA and several incidents in Samara Russia. In the first case a man sleeping in his bedroom in Tampa Florida, disappeared when a 5 – 10m diameter sinkhole opened suddenly under his house. The estimated depth of the sinkhole was approximately 10m. Despite the authorities’ efforts the 37 year old man could not be rescued. 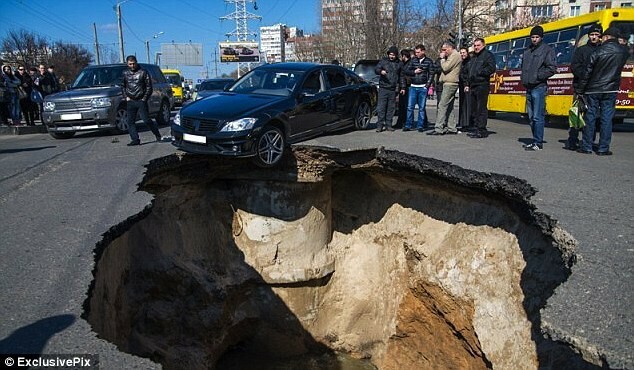 In city of Samara in Russia similar phenomena disturb everyday life. It has been reported that huge sinkholes have sprung up all over the city, in car parks, intersections and road sides, sometimes big enough for busses to disappear in them. But why some areas like Florida are plagued by sinkholes? Sinkholes are mostly a karstic feature along with caves and underground drainage systems. Karstic landscape is formed from the dissolution of soluble rocks such as limestones, dolomites, marble, gypsum and salt. Such karst region is Florida, presenting numerous superficial karstic features i.e. sinkholes or dolines. In order to understand and deal with this geologic hazard the American Geological Institute, produced an interesting booklet, explaining such phenomena. Solution sinkholes appear when acidic water moves through the bedrock dissolving it. The underground water flow dissolves soluble rocks at or just below the water table. This way underground water canals in bedrock are expanded and roof caves can collapse when becoming too wide to support the bedrock overlying them. The danger of collapse increases when water table is lowered and underground caves are drained thus eliminating water buoyancy (supporting force). Usually soils overlying bedrock are forming a sinkhole when deeper soils wash into underground karstic caves. This case is the most common occurring. Human activity such as poorly designed drainage, failed water and sewer systems and ground vibrations can lead to sinkhole formation, mainly because large amounts of surface water infiltrates in soluble bedrock. In addition dewatering activities trigger the appearance of sinkholes by rapidly lowering water tables.